On November 26,2018, Genentech, a member of the Roche Group (SIX: RO, ROG; OTCQX: RHHBY), announced that the U.S. Food and Drug Administration (FDA) has approved ACTPen™ 162 mg/0.9 mL, a single-dose prefilled autoinjector for Actemra® (tocilizumab) as an additional formulation for adult patients with moderate to severe active rheumatoid arthritis (RA) who have had an inadequate response to one or more disease-modifying anti-rheumatic drugs (DMARDs), and for adult patients with giant cell arteritis (GCA). Further, the ACTPen can be administered by caregivers to patients two years of age and older with active polyarticular juvenile idiopathic arthritis (PJIA) or active systemic juvenile idiopathic arthritis (SJIA). The ability of pediatric patients to self-inject with the ACTPen has not been tested. The ACTPen is expected to be available in January 2019. 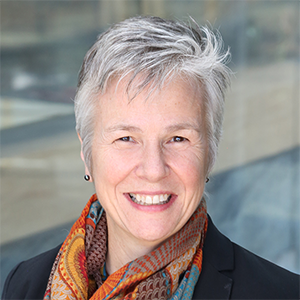 “When it comes to the administration of medicines, we believe patients should have choices, when possible,” said Sandra Horning, MD, Chief Medical Officer and Head of Global Product Development for Roche/Genentech. “With ACTPen for Actemra, we are pleased to offer an additional option to patients who may prefer using the new autoinjector over other formulations.”The FDA first approved Actemra intravenous infusion formulation (IV) for adults with RA in January 2010 and Actemra pre-filled syringe (PFS) formulations for subcutaneous injection (SC) for adults with RA in October 2013. In May 2017, Actemra SC became the first therapy approved by the FDA for the treatment of adult patients with GCA, a chronic and severe form of vasculitis characterized by inflammation of certain large blood vessels. 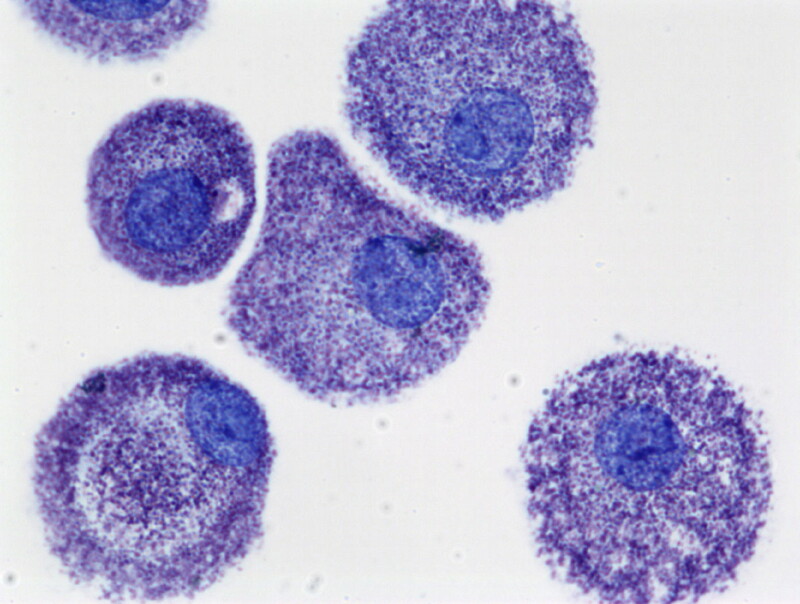 In work published online on November 9, 2018, in Science, Duke University Medical Center researchers, and colleagues, demonstrate that IgE-sensitized mast cells (MCs) (image) are indirectly activated by blood-borne allergens. In addition, the study revealshow perivascular dendritic cells (DCs) continuously sample blood and initiated and markedly enhance inflammatory and immune responses by rapidly discharging antigen-bearing microvesicles (MVs) to surrounding immune cells. the Science article is titled “Perivascular Dendritic Cells Elicit Anaphylaxis by Relaying Allergens to Mast Cells Via Microvesicles.” The results may resolve the conundrum of how mast cells, which are extravascular, are able to perceive and react to blood-borne allergens. The scientists describe the existence of a CD301b+ perivascular DC subset that continuously samples blood and relays antigens to neighboring MCs, which vigorously degranulate and trigger anaphylaxis. DC antigen transfer involved the active discharge of surface-associated antigens on 0.5- to 1.0-micrometer MVs generated by vacuolar protein sorting 4 (VPS4). Antigen sharing by DCs is not limited to MCs, as neighboring DCs also acquire antigen-bearing MVs. This capacity of antigen-bearing MVs to various immune cells in the perivascular space potentiates inflammatory and immune responses to blood-borne antigens. Anaphylaxis is a life-threatening allergic reaction triggered after antigen-specific immunoglobulin E (IgE) antibodies bind to target allergens. These antibodies than cross-link IgE-specific Fc receptors on the surface of MCs. The MCs rapidly release inflammatory mediators, including histamine, resulting in smooth muscle contraction, vasodilation, and blood vessel leakage. 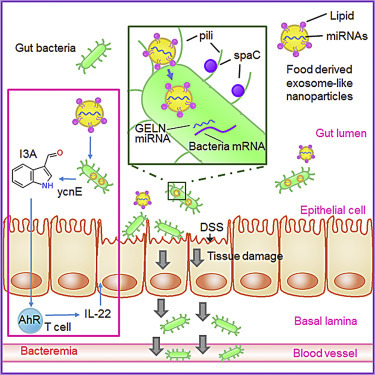 In work published in the November 14, 2018 issue of Cell Host & Microbe, researchers from the James Graham Brown Cancer Center, Department of Microbiology & Immunology, University of Louisville in Kentucky, together with colleagues, demonstrate that plant-derived exosome-like nanoparticles (ELNs) are taken up by the gut microbiota and contain RNA that alter the mouse microbiome composition and host physiology. The article is titled “Plant-Derived Exosomal MicroRNAs Shape the Gut Microbiota.” Specifically, the authors show that ginger ELNs (GELNs) are preferentially taken up by Lactobacillaceae in a GELN lipid-dependent manner and contain microRNAs (miRNAs) that target various genes in Lactobacillus rhamnosus (LGG). In particular, the authors noted that the GELN mdo-miR7267-3p-mediated targeting of the LGG monooxygenase ycnE yields increased indole-3-carboxaldehyde (I3A). GELN-RNAs or I3A, a ligand for aryl hydrocarbon receptor, are sufficient to induce production of IL-22, which is linked to barrier function improvement. According to the authors, these functions of GELN-RNAs can ameliorate mouse colitis via IL-22-dependent mechanisms. The authors conclude that their findings indicate how plant products and their effects on the microbiome can be used to target specific host processes to alleviate disease. Note that the image here was taken from the article abstract and can be much better viewed at the abstract itself (at the link below). The Precision Medicine World Conference (PMWC), celebrating ten years of operation, will take place at the Santa Clara Convention Center (Silicon Valley, California) January 20-23, 2019. This is expected to be the largest Precision Medicine World Conference ever, with 2,500 attendees. This amazing gathering of prestigious experts in multiple inter-related fields and those interested in learning more is co-hosted by UCSF, Stanford Health Care/Stanford Medicine, Duke University, Duke Health, and Johns Hopkins University. The program will cover innovative technologies, thriving initiatives, and clinical case studies that enable the translation of precision medicine into direct improvements in health care. Conference attendees (https://www.pmwcintl.com/about/#audience) will have an opportunity to learn first-hand about the latest developments and advancements in precision medicine and cutting-edge new strategies and solutions that are changing how patients are treated. The conference’s five-track program will include sessions on the following major topics, among many others: AI & Data Science; Clinical & Research Tools; Clinical Diagnostics; Creating Clinical Value with Liquid Biopsy ctDNA, etc. ; Digital Health/Health and Wellness; Pharmacogenomics; Emerging Technologies in Precision Medicine; Immunotherapy; Large-Scale Bio-Data Resources to Support Drug Development; Rare Disease Diagnosis; and Wellness & Aging. Conference organizers have assembled a hugely impressive lineup of 450+ highly regarded speakers, featuring pioneering researchers and authorities across the healthcare and biotechnology sectors (https://www.pmwcintl.com/2019sv/speakers/). Thousands of Recombination Events Identified in APP Gene in Alzheimer’s Brains; Changes Depend on Reverse Transcriptase; “Findings Provide Scientific Rationale for Immediate Clinical Evaluation of HIV Antiretroviral Therapies in People with Alzheimer's"
Scientists from Sanford Burnham Prebys Medical Discovery Institute (SBP) in San Diego, California, have identified gene recombination in neurons that produces thousands of new gene variants within Alzheimer's disease brains. The study, published online on November 21, 2018 in Nature, reveals for the first time how the Alzheimer's-linked gene, APP (the gene coding for amyloid precursor protein--see image), is recombined by using the same type of enzyme found in HIV. The article is titled “Somatic APP Gene Recombination in Alzheimer’s Disease and Normal Neurons.” Using new analytical methods focused on single and multiple-cell samples, the researchers found that the APP gene, which produces the toxic beta amyloid proteins defining Alzheimer's disease, gives rise to novel gene variants in neurons--creating a genomic mosaic. The process required reverse transcription and reinsertion of the variants back into the original genome, producing permanent DNA sequence changes within the cell's DNA blueprint. "We used new approaches to study the APP gene, which gives rise to amyloid plaques, a pathological hallmark of the disease," says Jerold Chun, MD, PhD, , senior author of the paper and Professor and Senior Vice President of Neuroscience Drug Discovery at SBP. 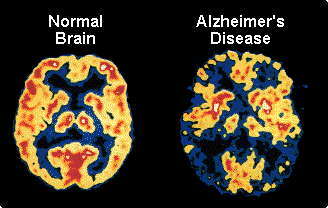 "Gene recombination was discovered as both a normal process for the brain and one that goes wrong in Alzheimer's disease." One hundred percent of the Alzheimer's disease brain samples contained an over-abundance of distinct APP gene variants, compared to samples from normal brains. Among these Alzheimer's-enriched variations, the scientists identified 11 single-nucleotide changes identical to known mutations in familial Alzheimer's disease--a very rare inherited form of the disorder. University of Texas (UT) Southwestern researchers have found that an enzyme on the surface of some lung cancer cells helps feed the cancer, making it a tempting treatment target. 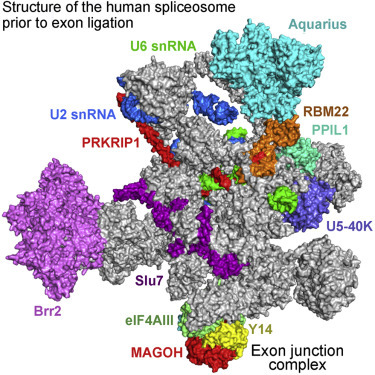 The enzyme, transmembrane serine protease 11B (TMPRSS11B), is described in a report published in the November 20, 2018 issue of Cell Reports. The open-access article is titled “Transmembrane Protease TMPRSS11B Promotes Lung Cancer Growth by Enhancing Lactate Export and Glycolytic Metabolism.” In addition to being found in squamous cell lung cancer and prostate cancer, the enzyme also has been identified in squamous cell head, neck, and cervical cancers, said Dr. Kathryn O’Donnell (photo), Assistant Professor of Molecular Biology. Her team identified TMPRSS11B while searching for genes that can convert precancerous lung cells into malignant cells that can form tumors. “In this study, we found that the enzyme strongly promoted the growth of certain types of lung cancer cells. We uncovered a new mechanism that expands our understanding of how cancer cells reprogram their metabolism to provide energy for rapid growth as they form tumors,” Dr. O’Donnell said. The researchers noticed that the enzyme was expressed at increased levels in human squamous cell lung cancers – a common type of non-small cell lung cancer – and that suppressing the levels of TMPRSS11B through gene editing or RNA interference reduced tumor growth in mouse models, she said. The research focused on TMPRSS11B’s ability to encourage the movement of lactate, a byproduct of cell metabolism long thought to be a waste product. Ground-breaking research last year from UT Southwestern Professor Dr. Ralph DeBerardinis’ laboratory found that, in fact, lactate provides fuel for growing tumors. Dr.
A DNA vaccine tested in mice reduces accumulation of both types of toxic proteins associated with Alzheimer’s disease, according to research that scientists say may pave the way to a clinical trial. A new study by the University of Texas (UT) Southwestern’s Peter O’Donnell Jr. Brain Institute shows that a vaccine delivered to the skin prompts an immune response that reduces buildup of harmful tau and beta-amyloid – without triggering severe brain swelling that earlier antibody treatments caused in some patients. “This study is the culmination of a decade of research that has repeatedly demonstrated that this vaccine can effectively and safely target in animal models what we think may cause Alzheimer’s disease,” said Dr. Roger Rosenberg, founding Director of the Alzheimer’s Disease Center at UT Southwestern. “I believe we’re getting close to testing this therapy in people.” The research, published online on October 20, 2018 in Alzheimer’s Research and Therapy, demonstrates how a vaccine containing DNA coding for a segment of beta-amyloid also reduces tau in mice modeled to have Alzheimer’s disease. In addition, the vaccine elicits a different immune response that may be safe for humans. The open-accessa article is titled “Active Full-Length DNA Aβ42 Immunization in 3xTg-AD Mice Reduces Not Only Amyloid Deposition But Also Tau Pathology.” Two previous studies from Dr. Rosenberg’s lab showed similar immune responses in rabbits and monkeys. The vaccine is on a shortlist of promising antibody treatments aimed at protecting against both types of proteins that kill brain cells as they spread in deadly plaques and tangles on the brains of Alzheimer’s disease patients. Although earlier research established that antibodies significantly reduce amyloid buildup in the brain, Dr. Rosenberg’s team needed to find a safe way to introduce them into the body. 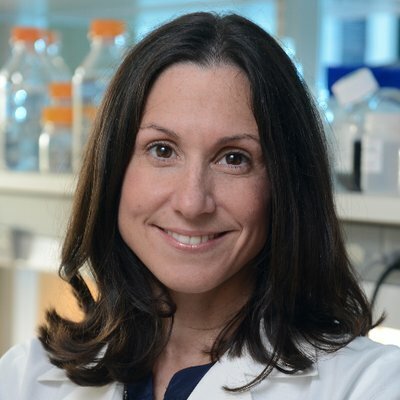 (BY RACHEL DERITA, PhD Candidate,Thomas Jefferson University, Department of Cancer Biology) Epileptic seizures are established to neuroscience as global excitation of neurons in the brain. However, new research from Jefferson (Philadelphia University & Jefferson University) in Philadelphia and collaborating institutions has uncovered a previously unknown period of time before an epileptic seizure in which there is an activation of inhibitory neurons. “This is the first time, to our knowledge, that this phenomenon of inhibition at the start of a seizure has been observed in humans,” states senior author of the study Shennan Weiss, MD, PhD, Assistant Professor of Neurology and Head of the Thomas Jefferson Computational Epilepsy Laboratory at the Vickie & Jack Farber Institute for Neuroscience at Jefferson. Before now, this was a phenomenon only observed in chemically-induced seizures in research animals, and was therefore considered an artifact of the experimental models. In the current study, published online on September 4, 2018, in the Annals of Neurology, surgeons collaborating between Jefferson and the University of California at Los Angeles (UCLA), used electrodes to determine the exact location of the seizures occurring in an epilepsy patient. They then were able to track action potentials from single neurons, classified as either excitatory or inhibitory. It was observed that there was a burst of activity from the inhibitory neurons prior to activity of the excitatory neurons. Epileptic patients often experience a period of time prior to a seizure characterized by auras, confusion, and an inability to speak clearly or form coherent sentences. A previously unappreciated interaction in the genome turns out to have possibly been one of the driving forces in the emergence of advanced life, billions of years ago. This discovery began with a curiosity for retrotransposons, known as "jumping genes," which are DNA sequences that copy and paste themselves within the genome, multiplying rapidly. Nearly half of the human genome is made up of retrotransposons, but bacteria hardly have them at all. Nigel Goldenfeld, PhD, Swanlund Endowed Chair of Physics at the University of Illinois at Urbana-Champaigne (UIUC), and Director of NASA Astrobiology Institute for Universal Biology at UIUC; and Thomas Kuhlman, PhD, a former Physics Professor at UIUC who is now at the University of California, Riverside, wondered why this is. "We thought a really simple thing to try was to just take one (retrotransposon) out of my genome and put it into the bacteria just to see what would happen," Dr. Kuhlman said. "And it turned out to be really quite interesting." Their results, published online on November 19, 2018 in PNAS, give more depth to the history of how advanced life may have emerged billions of years ago -- and could also help determine the possibility and nature of life on other planets. The title of the open-access PNAS article is “Testing the Retroelement Invasion Hypothesis for the Emergence of the Ancestral Eukaryotic Cell.”Along the way to explaining life, the researchers first encountered death -- bacterial death, that is. When they put retrotransposons in bacteria, the outcome was fatal. "As they jump around and make copies of themselves, they jump into genes that the bacteria need to survive," Dr. Kuhlman said. "It's incredibly lethal to them." Good nutrition in early life may protect against stress-induced changes in brain development in young mice, according to data presented at the Society for Endocrinology 2018 Annual Conference in Glasgow (November 19-21). The study findings suggests that a nutrient-rich diet may have protective effects on brain development in young mice exposed to early-life stress, which reduces their risk of learning and memory issues in later life. It has been reported, in humans and animals, that exposure to adversities, such as stress, in early life can have long-lasting effects on brain function, and may lead to cognitive problems in later life. The period just after birth is critical for brain development and demand for nutrients is high, both for energy and as essential building blocks for the developing brain. Therefore any deficit in essential nutrients during this time could result in long-lasting abnormalities in brain function, including learning processes. The stress and metabolic processes of the body are closely interlinked, and whether stress-related cognitive problems in early life can be prevented or even reversed by ensuring good nutrition has not been fully investigated. In this study, Dr. Aniko Korosi and colleagues from the University of Amsterdam, investigated the effects of essential nutrients on brain function using a mouse model of early-life stress. Early-life stress was mimicked by reducing the amount of maternal care and attention given to pups within the first 2 weeks of birth. By the age of 4 months, these neglected mice show several impairments, including increased body fat levels, high stress hormone levels, and poor performance in learning and memory tasks.